Looking north from the Green Line. Work on the UG1 segment. between 104th and 111th streets. Work on the elevated Aviation/Century Station. Looking south toward Aviation/Century Station. Work on the bridge that will span Manchester Boulevard. 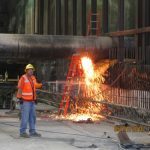 Work on the bridge that will span the 405 freeway. 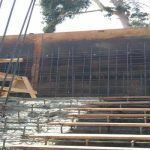 Near Faithful Central Bible Church, where stairs and ramp walls being constructed1. 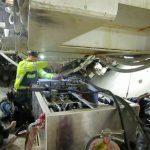 Work on underground segment 3 between 59th and 67th streets. Work on underground segment 3. Park Mesa Heights … Placement of curb and gutter. 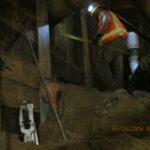 Work in the underground segment between Exposition and Vernon. Lagging along the west wall and hand excavation around supported utility. Hand excavation around supported utility. Martin Luther King Jr. Station. 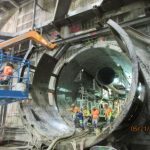 Tunneling under Crenshaw Boulevard — installation of the segment ring. 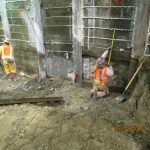 Tunneling under Crenshaw Boulevard — check grouting operations. 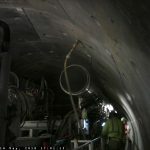 Tunneling under Crenshaw– testing the probe drill- used to check the ground ahead of the tunnel. 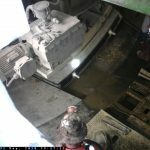 Tunneling -removal of thrust ring used to launch the TBM. 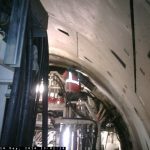 Tunneling – setting tunnel segment during ring build. Photos are from south to north. Credit: Metro. 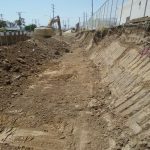 Where under Crenshaw Boulevard is “Harriet” the tunnel boring machine? 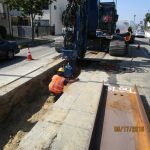 Harriet has been moving southbound under Crenshaw Boulevard and is now south of Coliseum Street. 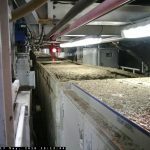 The tunnel boring machine (TBM) is 400 feet long and 21.5 feet in diameter. The TBM crew is manned by 75 workers laboring on a 24/7 schedule. 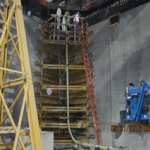 Harriet is expected to reach the north side of the Martin Luther King Jr. station box by late this summer. 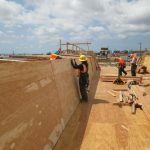 Walsh/Shea Corridor Constructors (WSCC) is now installing waterproof membrane,building station facilities and the perimeter lower walls as well as grouting work. 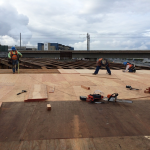 Walsh/Shea Corridor Constructors (WSCC) continues to work on the station, with work on the subfloor underway. 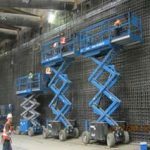 The third bracing segment and waterproofing membrane installation around the lower walls is in process. 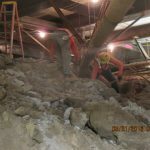 Excavation continues on the entrance and exit portal to the underground segment, where WSCC is finishing installing braces. The hanging of utilities is taking place as well as removal of the remaining Tesoro pipeline. Work will be done in five stages for the northern segment of the right-of- way in Park Mesa Heights between 54 th and 48th streets. 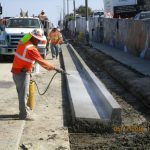 New curbs, gutters and sidewalks are being built and new street lights and traffic signals will be installed. 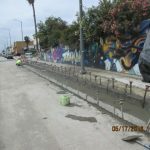 Crenshaw Boulevard will also be re-surfaced. 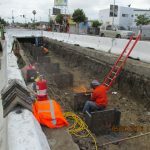 The replacement of a storm drain at specific locations along the western side of Crenshaw Boulevard is also taking place from 48 th to 52nd streets. 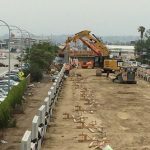 The process to install steel piles on the east side of the rail right-of- way has been completed. 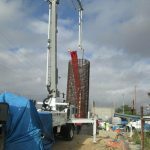 Metro is now working on the west side of Crenshaw Boulevard installing steel piles. Later, excavation will take place in the center of the street. 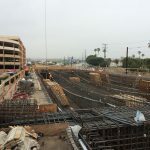 Construction of the Fairview Heights, Downtown Inglewood and Westchester/Veterans stations are underway with foundation and footing work for the platforms and ramps. Conduits have been installed to house communications and electronics equipment. 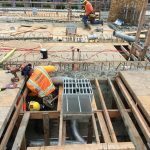 In the city of Inglewood, Metro is building a new storm drain between Centinela Avenue and La Brea Avenue. 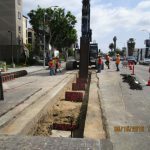 Relocation of phone equipment, water lines and sewer lines is also taking place. 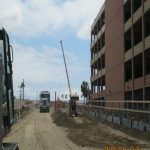 The bridge’s superstructure over La Brea Avenue is completed — this is the first of six aerial structures on the project. Construction crews are now completing work on the Mechanically Stabilized Earth (MSE) walls on either side of the bridge. 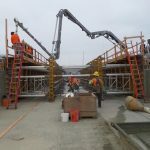 Construction continues on the rail bridge over the 405 freeway. Crews are working on the foundation and the MSE walls. 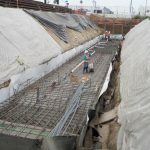 The abutments and the columns on both sides of the freeway are finished. 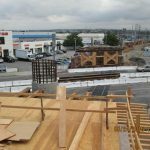 The falsework or framing to create the superstructure will begin in the coming months. 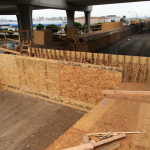 Falsework (framing) for the bridge superstructure continues. 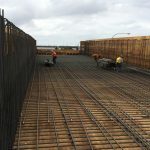 Installation of rebar to complete the deck of the elevated structure is more than 80 percent. Construction of the MSE wall on the south side of the station is completed and work continues on the north side’s MSE. 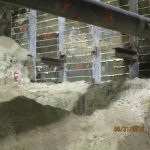 The trench from 104th to 111th streets is 50 percent completed. If you’re flying into LAX’s south runway, look out the right side of the plane for a good view of the trench just before landing. 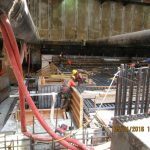 The abutments on both sides of 111th Street are finished and concrete is begin place at the bridge deck. 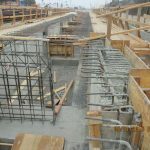 This bridge will allow motor vehicle traffic to enter the cargo area of the airport. Work continues on the bridge superstructure with falsework and rebar installation are now underway. 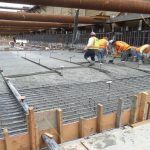 The pouring of concrete is expected to begin this summer. Line and Green Line. The new yard will include a main shop, a washing facility, a cleaning platform, a material storage building and a wheel truing shop, plus office space where approximately 200 Metro employees will work around-the- clock.